Adapt to the economic changes, says Pairin | Daily Express Online, Sabah, Malaysia. Tenom: The weakening of currency is not only experienced by Malaysia but other countries as well due to global economic uncertainties.Parti Bersatu Sabah (PBS) President Tan Sri Joseph Pairin Kitingan said, there are certain quarters that doubt the government's ability in governing the country and claimed it has caused the depreciation of the Ringgit. "We should be grateful as our economic foundation is still strong. Therefore, we should take into consideration the proposals by Bank Negara Malaysia's Governor in modifying the approaches and adapting one self to the current economic changes. "We should be always confident that the nation's economy will be positive again. Hence, we should spend smartly, rearrange our expenditure, and work hard to increase our productivity," Pairin said during PBS Melalap annual meeting, here, on Friday. Towards this end, Pairin who is also Deputy Prime Minister, urged the people, especially PBS members to remember the party's fight since its inception to defend the people and build a better future as "this should be the focus of our fight." "And in our effort to strategise to achieve our aims, we should utilise our time fully to discuss matters that can improve the people's situation and contribute inputs to the leadership." As such, Pairin also said, committed efforts should be put in place on government plans which are still ongoing and that there are still many issues that have to be tackled. "Therefore, we should pay more attention on the matters that we are facing now so that our focus is not affected," he stressed. He added, in facing the current challenges, there will be many parties that will try to influence the people, including through social media like WhatsApp. "Information technology is good, and only if the intention of using it is negative, then it becomes bad. If it is used to spread lies, then it is not good. "If the intention is to divert our thinking, then it is not good, especially in the spreading of edited photos which can lead to negative perception. "We should be always wary so that we can make the right decision, so that our vision and hearing is sharp and correct by doing proper reviews," he said. Earlier, PBS Melalap Chief, Datuk Radin Maleh stressed that the track record of PBS since 30 years ago has been good. Nevertheless, there are still some who have negative perceptions on the party and claimed PBS has lost its prowess and failed to achieved its objectives, said Radin who is also the party's Vice President. 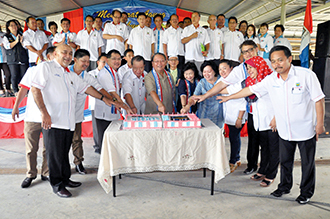 Radin described the formation and achievement of PBS while heading the State Government in 1985 is due to the full support of the multiracial community. "The government's policies then were not in line with the people's aspiration which was why it was rejected by the people who shifted their support to PBS. "We admit many PBS members were influenced by perceptions spread by those who were against PBS then… and eventually they joined other parties. "These group of people jumped ship with high hopes for personal gains and not to defend the people or the state's interests... and this is apparent before and also during the 13th General Elections," he said. But Radin said, the people's support is not wasted as the Federal Government under the leadership of Datuk Seri Najib Tun Razak formed the Royal Commission of Inquiry on Illegal Immigrants in Sabah in 2012, and also established the Eastern Sabah Security Zone (Esszone) and Esscom in 2013. Furthermore, he said, Putrajaya had also accepted PBS' proposal to declare Sept 16 as a public holiday nationwide in conjunction with Malaysia Day. "The proposal was submitted by the party's president himself to the leadership of Barisan Nasional (BN) in 2008." Radin said, eventually the proposal came to reality after Najib became the Prime Minister in 2009.